One surefire way to determine the success of a recipe is to eat the dish every night for a week and if you find yourself craving more after it’s gone, you know you’ve got a winner. For instance, you know a batch of baked shells is worth sharing with the world (and by “the world” I mean my mother and the three other kind souls that read my blog) when you single-handedly take down three-quarters of the pan and, when they’re finally gone, you find yourself wishing for just one more dinner’s worth. Forgive me for a moment while I lament the fact that these little beauties will not be my dinner again tonight. 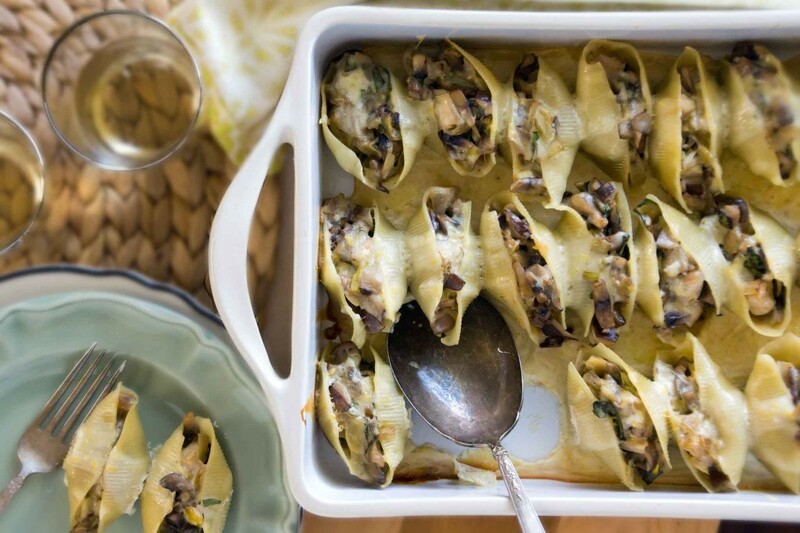 Alright, I’ve had a moment to compose myself and I’m ready to tell you all about these spring vegetable stuffed shells. 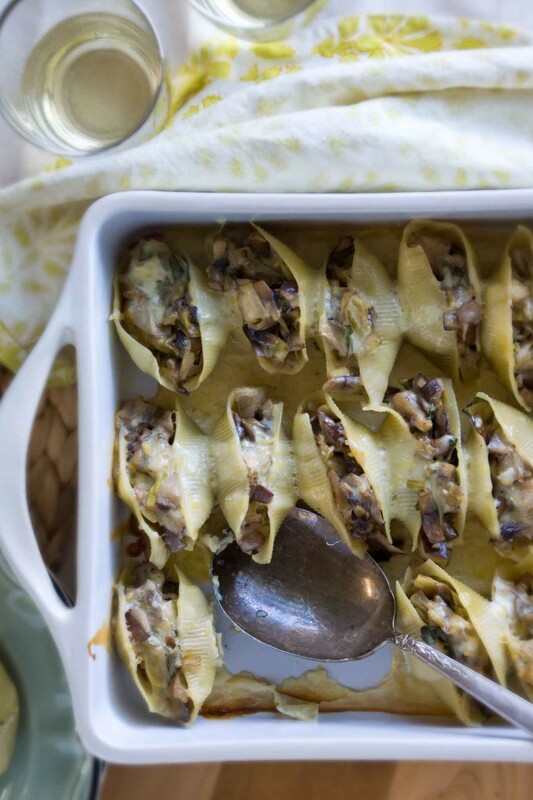 The shells have been stuffed with a filling of sautéed mushrooms, leeks, artichoke hearts, and tarragon. They’re then blanketed in a lemony béchamel sauce and baked, with just enough cheese melted over the top. 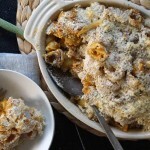 All in all, it’s my perfect kind of comfort food–cheesy and a bit indulgent, but not to the point where you’ll be wracked with guilt after eating it, nor is it “food-coma” heavy. It’s exactly the kind of thing I could eat it every night of the week–oh wait, I kinda did. Let’s get down to business. 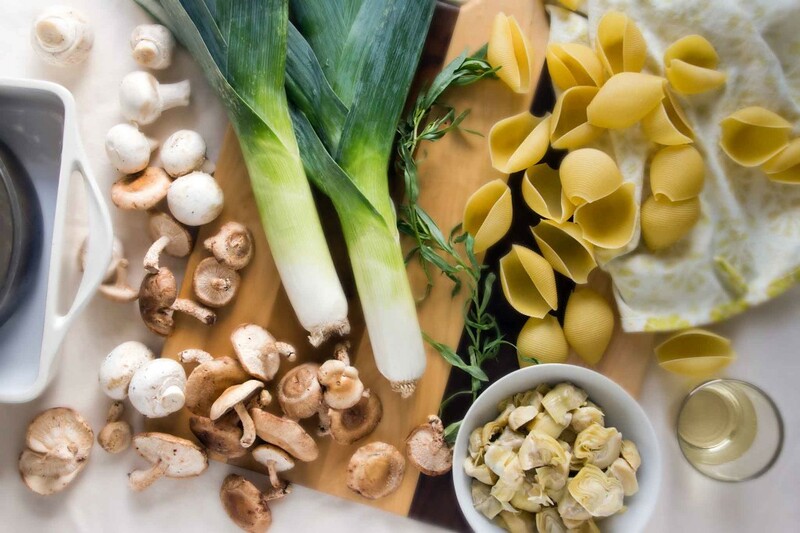 You’ll need two dozen or so pasta shells, a couple of leeks, a can of artichoke hearts, fresh tarragon, and loads of mushrooms. I used about two-thirds regular old button mushrooms, one-third shiitake. You could certainly use all shiitake but that could get pretty pricey. You’ll also need some white wine, Fontina cheese, and the makings for béchamel sauce. 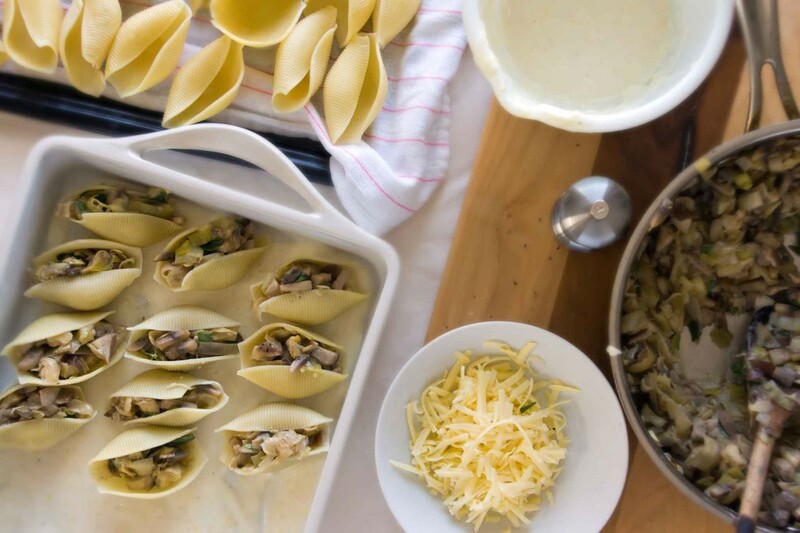 Side note–if you don’t want to use shells, you could roll out sheets of fresh pasta and roll them around the filling to make cannelloni. Or you could layer it up for a spring vegetable lasagna. You could use it to fill crepes. Or you could make a killer croque monsieur-esque sandwich. But I digress–we’d better just stick to the shells for right now. For the filling, you’ll chop the mushrooms and saute them with a few sliced leeks. Add a splash of white wine, then stir in some artichoke hearts and a handful of tarragon. I love that depending on how you treat mushrooms, they can taste dark, dusky, and just like fall or light, fresh, and springy as they do here. Cook the pasta shells, make a batch of béchamel, grate a pile of cheese, and start putting it all together. Smear a thin coating of béchamel around a baking dish. Stuff each shell with a few spoonfuls of the mushroom filling and start arranging them in the pan. Pour the rest of the béchamel over the top, sprinkle with cheese, and bake. As the shells bake, your kitchen will fill with the aroma of earthy mushrooms, warm cream and melted cheese, the anise-y tarragon, zesty lemon, and the promise of a delicious dinner and perhaps a new favorite recipe. 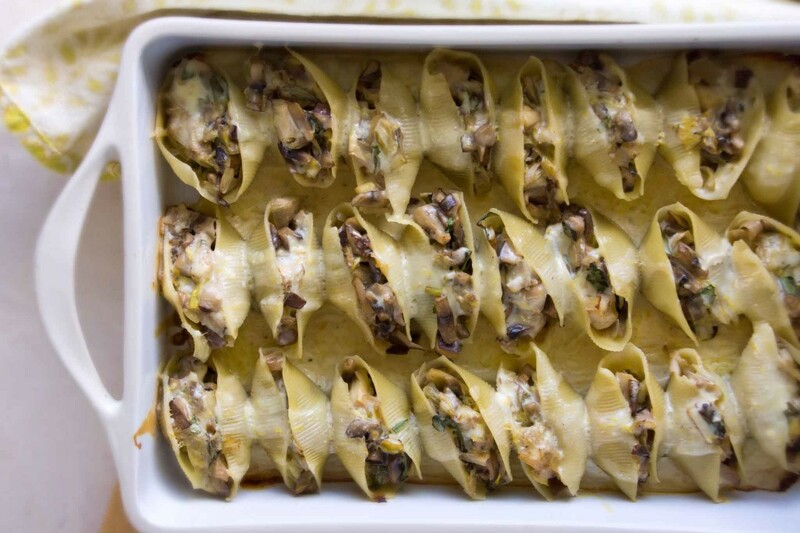 You could certainly assemble the stuffed shells the day before you plan to bake and serve them. If you have any of the mushroom filling leftover, it would be delicious used in panini, as an omelette or crepe filling, or spread on crostini. Cook the pasta shells in salted water according to package instructions. Drain and spread on a towel-lined baking sheet to cool and dry off. Heat 3 Tbsp. butter in a wide sauté pan over high heat. Add the mushrooms and leeks. It will seem like way more than you could ever possibly need at first, but trust me, they'll cook way down. Saute, stirring frequently, until the mushrooms stop throwing off moisture and begin to brown, 10-12 minutes. Season with salt and add the artichokes and sauté for 2 more minutes. Pour in the wine and allow it to cook off, about 2 more minutes. Remove from heat. Taste. Season, as necessary, with salt and freshly ground black pepper. Stir in about ½ of the grated Fontina cheese and the chopped tarragon. Set aside while you make the béchamel sauce. To make the béchamel, heat the milk to almost a boil in a small saucepan. In a medium saucepan, heat 2 Tbsp. butter until it melts and starts to bubble then whisk in the flour to make a roux. Cook the roux, stirring constantly, until it turns a pale golden and the raw floury taste cooks off, about 5 minutes. Slowly pour the hot milk into the roux, whisking constantly. Continue to whisk, bring to a boil, then reduce the heat, and cook until thickened, about 10 minutes. Remove from heat. Season with salt and black pepper, stir in the lemon zest and a few gratings of nutmeg. Allow to cool slightly. Spread the bottom and sides of a 9 x 13 inch baking dish with a thin coating of the béchamel. Spoon a few Tbsp. 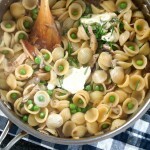 of the mushroom mixture into each pasta shell and arrange the shells in the pan. When you've stuffed all of the shells, spoon the remaining béchamel sauce over the shells and sprinkle with the remaining Fontina cheese. Poke a few holes in a sheet of foil and loosely cover the pan (be sure the foil does not come in contact with the cheese so it doesn't stick to the foil as it melts). Bake for 30 minutes, then remove the foil and continue to bake until the cheese is bubbly and golden, 10-15 minutes. Okay.. I was just thinking of inviting you and Matt over for Sunday dinner but I think I will shamelessly invite Dad and myself to YOUR place instead! 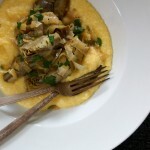 You have been putting all my favorite things on your blog lately… gnocchi, stuffed shells, etc. etc…..I’ll bring the wine, hint, hint!! 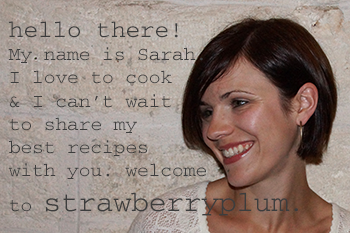 Hi Sarah, I have been reading your site frequently and have tried a few of your recipes and can’t wait to try this one! You are an amazing cook and love to read your blog.. I would never have been adventurous to try leeks and kale if not for your recipes–and I like both. See you this summer! Hi Laura, it’s nice to hear from you and I’m so happy my recipes have inspired you to bring leeks and kale into your life! See you at the wedding! Hi Ariane, thank you so much for your nice comment! Keeping up my blog can be challenging at times, but remarks like yours keep me going and make it feel very worthwhile!